I have been trying out meal delivery services for a while now. I really like that everything I need is delivered in one box, including all the little things too such as sauces and such. 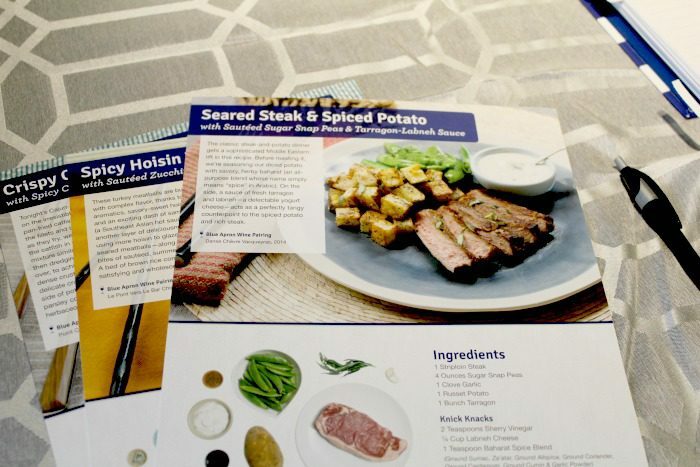 I recently had the chance to try out Blue Apron, which by far, has been my favorite meal service. I really love that everything I need is delivered to my doorstep. 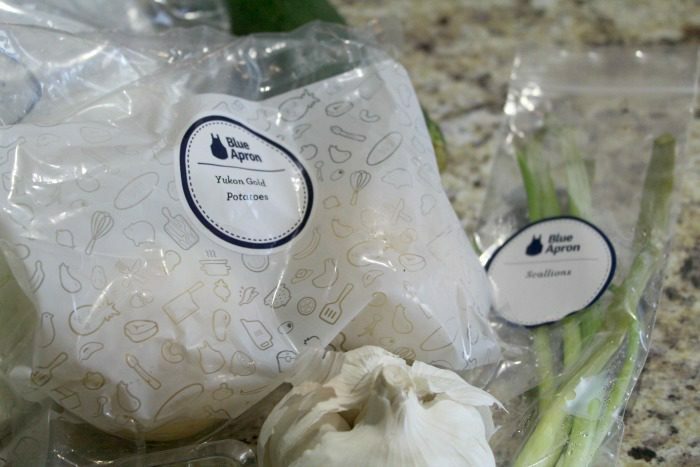 Blue Apron offers a better way to cook, with fresh ingredients and great recipes delivered weekly to your home. They feature farm-fresh ingredients from sustainable family-run businesses, and set the highest standards for their ingredients. You can even accompany each meal with the perfect wine pairing, shipped right to your door! Ordering the meals were easy. 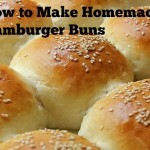 I simply went to BlueApron.com and set up my account. You can choose to either have 3 meals for 2 people delivered, or they have a family package you can purchase as well. I decided to go with the smaller package since I was just trying it out. They showed me what was available for meals that week, and if I didn’t like any of the meals, I could switch them out for something else. They have seafood options, but if you are not a fan of those, when you set up your account, simply mark out that you want fish and they will remove those from your menu choice options. That made it easy for me to cut out what I didn’t want. Once my box arrived, I unpacked everything and put it away. Each ingredient is labeled for the meal it is for. The ingredients hold up well in the refrigerator. I was gone for almost 2 weeks before I was able to cook my meals and when I got home, everything was still fresh and ready for me to make my first meal. I chose the steak and snap peas as my first option. I am a huge steak lover so that beautiful piece of red meat was calling my name. I followed the recipe card that was sent with the meal and within 30 minutes I had the most delicious meal sitting in front of me! Now, they say that this meal makes enough for two people, but if you have a big man like I do, then it is only a one portion meal. 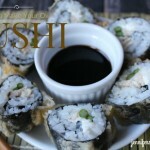 But – if you want to eat the CORRECT amount of portions, then this meal is the perfect size for two people. One of the things that I really love about this meal service is that it gets me out of the box when it comes to cooking and it introduces me to spices and herbs that I might have never cooked with before. 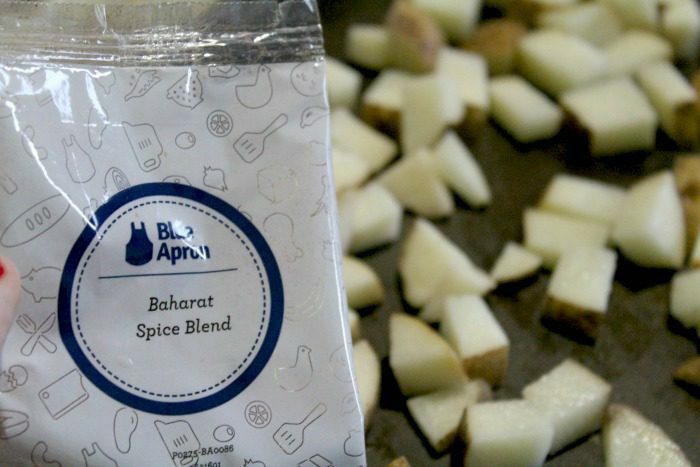 For example, my potatoes were coated in Baharat – which I had never heard of before. Let me just tell you – those potatoes were awesome! 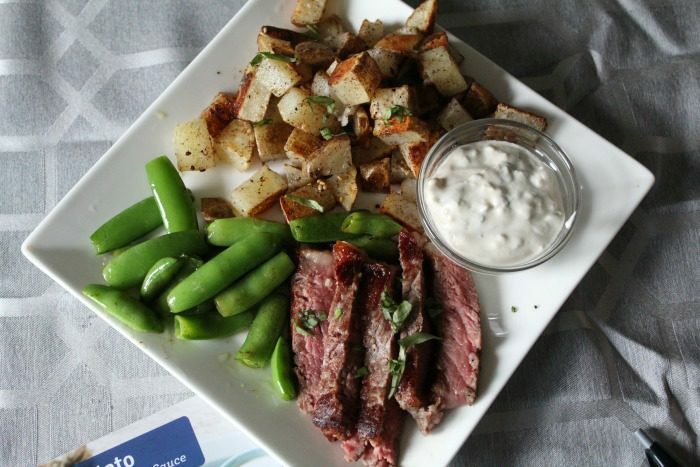 If you like to cook at home, but find yourself eating out a lot, you will really enjoy the Blue Apron service. 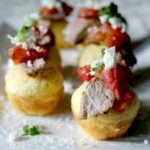 There is no more shopping at the grocery store (which is usually why people decided to grab a drive thru meal in the first place), and you will truly enjoy cooking for your family again. The pricing for this service is not that expensive. For about $10 a meal per person (which is normally less than what you would pay at a restaurant) you get a FANTASTIC dinner meal, which you can put on the table in 30 minutes or less. For the family meal, the price is even less! 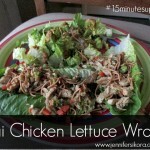 You can get 4 recipes per week for around $140 – and this will feed a family of four. Why would you not want to sign up? Fresh food, farm to table ingredients, and some of the best meals you will ever stick in your mouth. You can try it now and get $30 off or 3 free meals. Sign up today by visiting here. 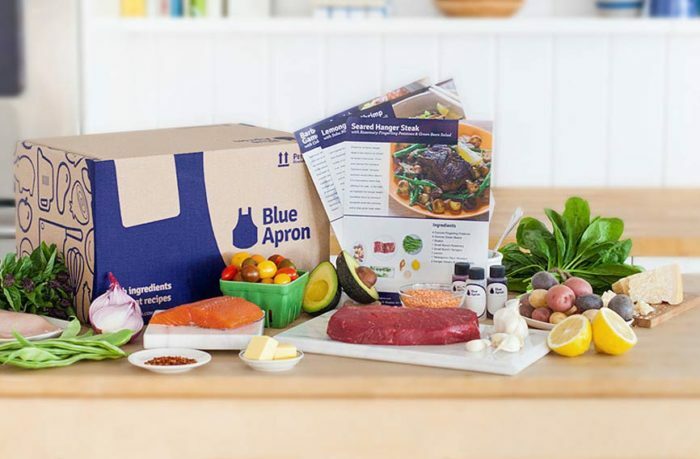 I do like Blue Apron quite a bit and have received a number of boxes from them (that I paid for). I recently ordered from Hello Fresh an one thing I prefer about Hello Fresh is that they organize their “extras” (such as condiments, etc) by meal, labeled on the box, so that I don’t have to go rummaging through the box and matching everything up. I agree with you about the “meals for 2″……I eat more than my husband (which I am sure you can figure out by looking at me lol), and for me it is more like ONE serving lol. I could change to 4 servings but that would be too much. Also, when I cook, I like to cook to have leftovers so that I am not cooking every day. 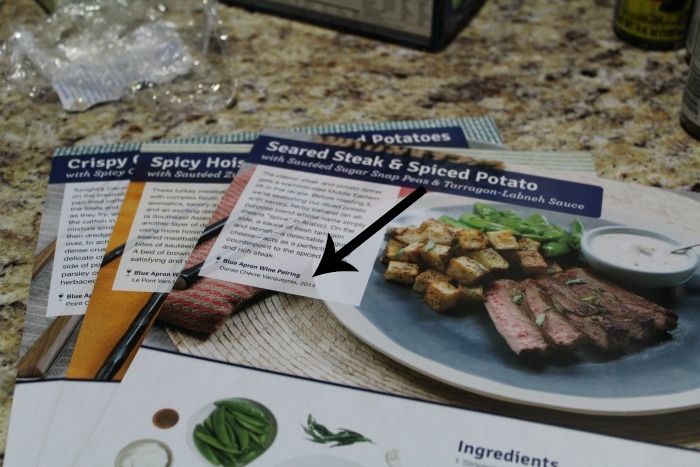 Blue Apron is great though and their customer service is superb. I just think Hello Fresh is a tad more organized and might even have slightly healthier meals. Oh and this was a GREAT review!